So far this year, the Payette National Forest has responded to two lightning caused and one human caused wildfires. All three fires were kept to less than .10 of an acre and suppressed with our initial attack resources. The Southern Idaho Timber Protective Association has also responded to three wildfires – all lightning caused and kept to less than .10 of an acre. 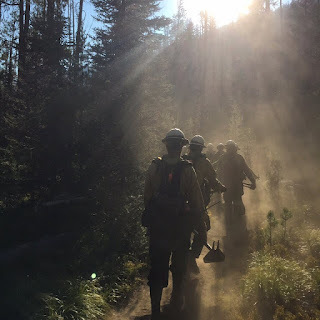 We expect a “normal” wildland fire season across the Payette National Forest this fire season, which typically starts in June and ends in late September or early October with a “season ending” weather related event. The height of the fire season in central Idaho typically begins in mid to late July. “A normal fire season for us means that we will have wildfires across the Forest,” said Sean Johnson, Payette National Forest Fire Management officer. “In a normal fire season we see as many as 100 wildfires.” Predicted weather over the summer months indicates that we may have large fire activity on the Forest, but the danger for large wildfire activity is less this year than it was last year. “We had a good snow pack in the mountains this past winter, but the hot weather we had in early June quickly melted the snow in higher elevations. Those warm temperatures increased water runoff from the mountains during late May and early June, which is not good for keeping heavy fuels wet as the heat of summer approaches,” added Johnson. The early runoff promoted the growth of fine fuels such as grasses across the Forest which can cause a wildfire to spread quickly. GovDelivery, send an email request to payettefireinformation@gmail.com. Social Media: Follow us on Facebook, (search for U.S. Forest Service – Payette National Forest), and on Twitter (‪#‎payetteForest‬).